Yay pretty! Please feel free to post that anywhere you want! I've also created an extras page on my website with icons, banners, bookmarks, etc. 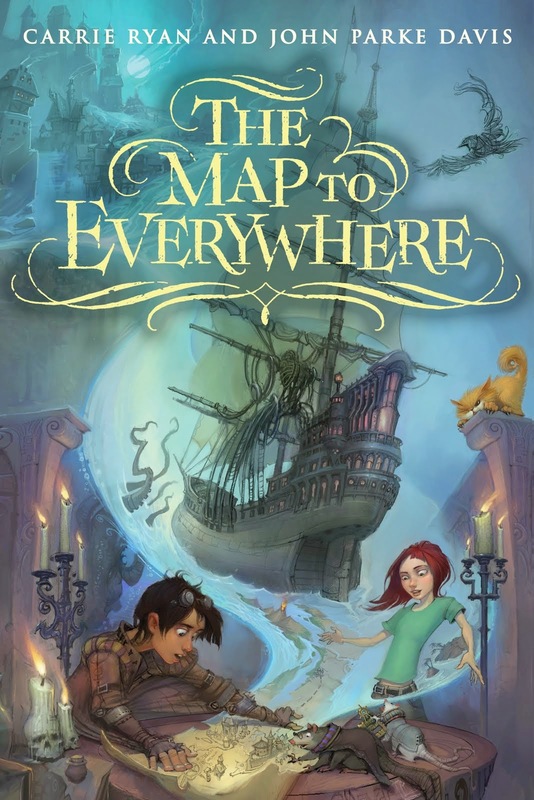 I have to say, I really REALLY dig the tag line that Random House came up with for this book - I get a kick out of it every time I look at it! And a HUGE thanks to Saundra Mitchell who put all the extras together -- she rocks! Okay, looking at that timer makes me feel a little ill. Really? 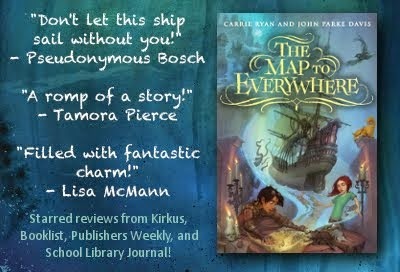 Really it's only two weeks until this book comes out?!? Gak! I feel like there's so much to do before then! I have to find clothes to wear on tour, I have to clean the house for a newspaper reporter coming tomorrow, I have to write a proposal and dig out of my email deluge and read and write and get my hair done and ..... deep breaths..... 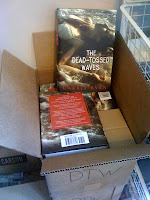 I should know we're getting close since I just got my boxes of author copies in the mail yesterday! YAY!! This time last year I was preparing for Team Castle. It still kind of boggles my mind that I got to spend my release week in Ireland with a bevy of amazing authors. Did I ever mention how there were peacocks who lived there in the castle courtyard? One peacock and two peahens and they'd fly up and sleep against a window in the alcove on the way to the bathroom on the second story so that you'd just go walking by and they'd shriek and so you'd shriek and they'd flap all over the place. One day I swear they almost marched straight into the kitchen to see what was for dinner. Yes, this is a blog of random dis-jointed thoughts and now you can see how my brain's been working recently :) On that note... I'm putting together my presentation for school and library visits -- anyone have thoughts of what topics work really well? I've given talks on how I came up with the world of FHT and the role of zombies in popular culture but have found that middle-schoolers often look at me blankly (appears few 8th graders have seen Night of the Living Dead!). My path to publication always feels boring to me... what would be a good exciting topic to speak on (this is for the school visits -- likely they haven't read the books). I really appreciate hearing your thoughts!! 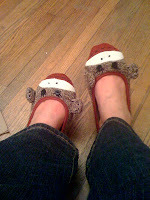 I leave you with my most recent purchase that gives me tremendous glee: monkey slippers. Seriously, can I wear these on the tour!? Awesome post!! I love your slippers!! cute! I posted the countdown widget on my blog.. 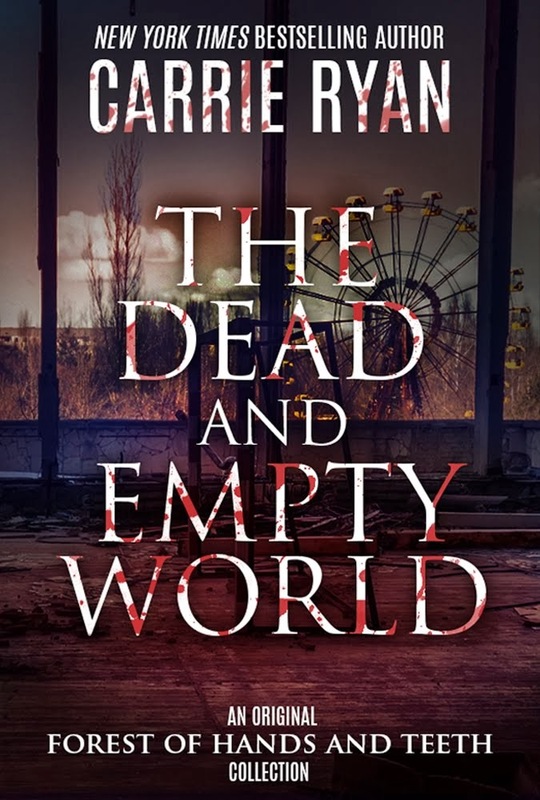 I can't wait to read Dead-Tossed Waves I'm terrified of zombie movies and yours has been the one and only zombie book series I will ever read. I loved the Forest of Hands and Teeth!! I remember the discussion you gave at the NC Literary Festival at UNC this past fall. I thought you did a great job. I was especially excited when you talked about NaNoWriMo and how you wrote the story for that. And while 8th graders might not understand the 60's refernce from Night of the Living Dead, they might still enjoy the story. I am not a horror movie fan, so I can't related, but would one of the more recent zombie movies also work? With my younger students we were really interested in the author's process. We wanted to see their writing journals, pictures of their working space, and the routines they used when they started writing each day. They also liked hearing that authors can sometimes struggle with ideas as much as they can. Thanks Terra and Cynthia for posting the counter! I have noticed (from working with kids) that they LOVE hearing random facts/stories about you! Anything funny/quirky/interesting really hooks them in and then if they like you and find you interesting, their chances of picking up your books increase dramatically. So for younger kids, between talking about the steps to publish a book, a story about something that happened to you while you grew up or while you were writing the book works really well! What dramatically stood out to me while I was student teaching was how much kids love stories. 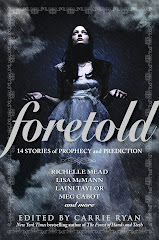 If you tell them some stories about you...you'll have them hooked, I promise! I agree with you...a powerpoint would be a GREAT hook! You could always use more recent zombie movies like Resident Evil, Dawn of the Dead, or Zombieland. There are actually a lot of movies and games (Left4Dead) although I suppose it does depend on just how young the children are to which you are speaking. 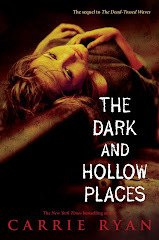 I teach high school English, and I know anything dark and disturbing tends to grab teenagers. Maybe you could discuss why dystopian novels are big right now. A lot of students have read classics like 1984 & Brave New World that reflected society's fears about totalitarianism or technology, but now kids are drawn to contemporary dystopian stories like yours and The Hunger Games. What do these books reflect about our culture today? What are our collective fears and secret desires? I loved FHT and have been talking it up at my school. I also wrote a review on my blog. I even made my school librarian buy it! 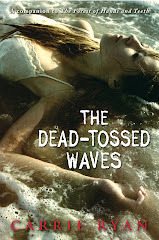 I cannot wait to read The Dead-Tossed Waves. Good luck with your tour! Gabriel linnon: I am the boy who gave you the letter and the poem when you came to greenville. 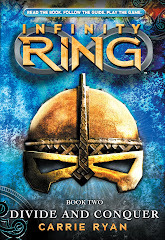 I can not wait till your new book!!!!!!! !